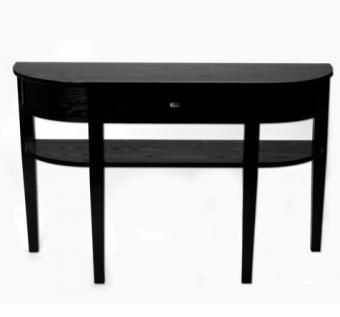 This demi-lune style table is made of solid ash, ebonized to a glossy black finish. 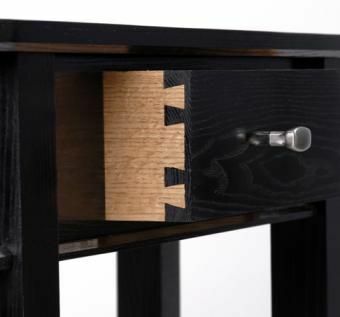 The single drawer is made of quarter-sawn oak with a solid ash bottom, and shows off hand-cut half-blind dovetails on the front and full dovetails on the back. The legs are tapered on all four sides starting just below the shelf. 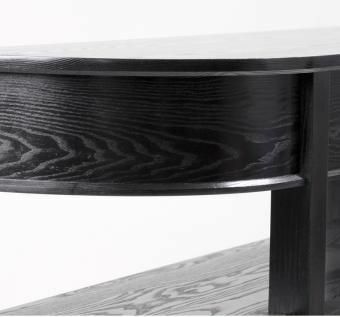 The clean lines of the table are accentuated by the gentle curve of the end aprons, and the simple beveled detail on the moulding and the under-side of the top. The table was of my own design based on overall dimensions requested by the customer. Dimensions: H 31" X W 48" X L 14"